It's my birthday and combining my two favorites, carrot cake and cheesecake to make a new single favorite! It is like a bite of heaven! IT IS ALSO SUPER RICH! 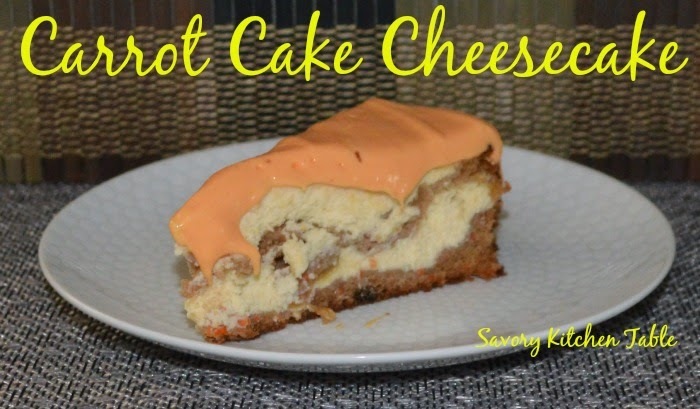 Next time I'm going to try a pumpkin carrot cheesecake. Butter a 9-inch spring form pan and set aside. In a mixing bowl, whisk together sugar and 1 1/2 teaspoon flour until well combined. Add cream cheese bit by bit using an electric hand mixer set on low speed blending together until smooth. Mix in eggs one at a time, mixing just until combined after each addition. Tap bowl against counter top several times to release the air bubbles and set mixture aside. In a small mixing bowl, whisk together 1 1/4 cup flour, baking soda, baking powder, salt, cinnamon and nutmeg. In a large mixing bowl combine canola oil, applesauce, granulated sugar, brown sugar, eggs and vanilla extract and blend mixture using electric hand mixer set on low speed for 1 minute. With mixer running on low speed, slowly add in dry ingredients and mix until well blended. Add carrots and mix until evenly distributed. Fold in raisins by hand. Tap bowl forcefully against counter top several times to release large air pockets. 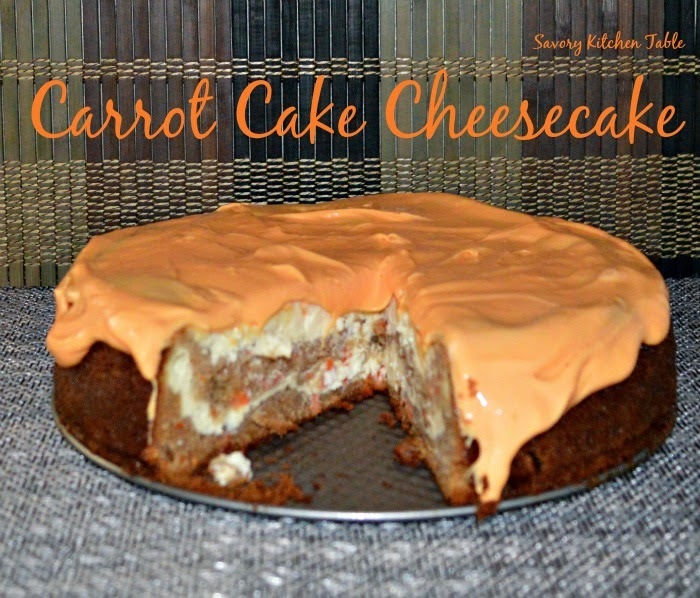 Pour 1 1/2 cups carrot cake mixture into buttered springform pan and spread into an even layer. Dollop about 1/3 of the cream cheese mixture by the spoonfuls over carrot cake layer (don't spread or swirl). Carefully spoon remaining carrot cake mixture over cream cheese layer, then finish by drizzling by the remaining cheesecake mixture over carrot cake layer, working to cover all of the carrot cake mixture. Bake in preheated oven 60 - 65 minutes, until center portion only jiggles slightly. Tent with aluminum foil at 40 minutes to prevent excessive browning (tent in a way that the foil doesn't touch cheesecake or it will stick). Remove from oven and allow to cool on a wire rack 1 hour. Cover with foil and chill in refrigerator 6 hours. Add topping and chill overnight. In a mixing bowl, using an electric hand mixer, whip together cream cheese and butter until smooth. Add remaining topping ingredients and mix until pale and fluffy, about 4 - 5 minutes. Spread evenly over cheesecake then chill cheesecake in freezer for 20 - 30 minutes. Sprinkle edges with chopped pecans.